Laying sequence has important effects on eggshell color and embryonic development in birds. Some birds can allocate resources unevenly among the eggs within a clutch, prioritizing those at the beginning of the laying sequence, in order to maximize reproductive success. The changes in egg color according to laying sequence may be an adaptation to pressure from predators or brood parasites. In this study, effects of laying sequence on egg color and embryonic heart rate in Russet Sparrows (Passer cinnamomeus) were investigated using artificial nest boxes. The eggs were divided into three groups: first to be laid, intermediate in the laying sequence, and last to be laid. We maintained the eggs in an incubator and measured embryonic heart rates. Avian visual modeling showed that the background color brightness of the last eggs laid was significantly higher (whiter) than those of the other eggs. All eggs were about the same size and hatched around 13 days, indicating that laying sequence significantly affected embryonic development speed; the last eggs to be laid developed significantly faster than did the first in the clutch. Our study quantified the effect of laying sequence on egg color variation and proved that laying sequence has an important effect on embryonic heart rate in Russet Sparrows. Laying sequence in birds strongly affects the color, mass, metabolic rate, and embryonic development rate of the eggs (Ruxton et al. 2001; Moreno and Osorno 2003; Griffith and Gilby 2013). The pigments covering eggshells are deposited in the 4 h preceding egg laying by pigment glands (Burley and Vadehra 1989). During the laying period, the pigments in some birds gradually decrease as the number of eggs laid increases, which results in a shift in eggshell color from dark to light over the course of the laying sequence. This phenomenon, which is relatively common among the Passer genus (Yom-Tov 1980; Ruxton et al. 2001; Poláček et al. 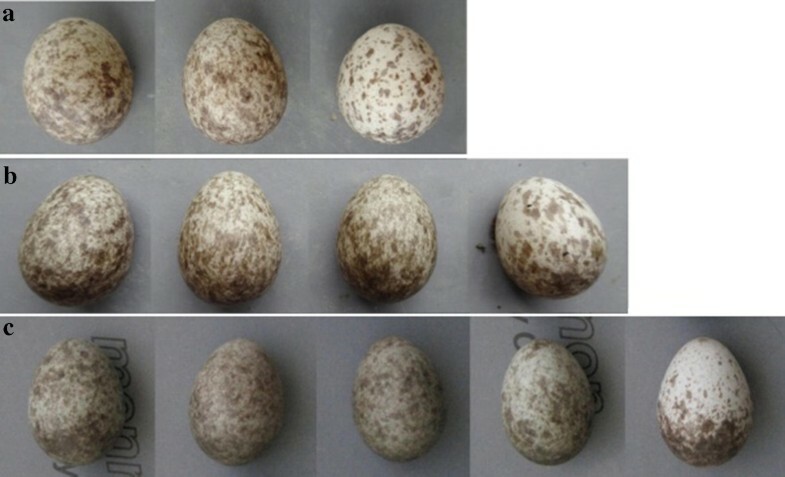 2017), produces a clutch with a diversity of egg colors; the lightest egg is the last one laid (Lowther 1988; Poláček et al. 2017). Previous studies showed that variation in egg color reflected differences in egg quality; the last eggs to be laid with lighter coloration were the poorest quality (Moreno and Osorno 2003; Soler et al. 2005). Parent birds often distribute resources, such as antioxidants and male hormones, unevenly over the course of the laying sequence (Hall et al. 2010; Boncoraglio et al. 2011). Therefore, eggs laid at different points in the sequence receive different resources, which could influence their embryonic development and ultimate fate (Lipar and Ketterson 2000; Nicolai et al. 2004; Groothuis et al. 2005; Granroth-Wilding et al. 2014; Poláček et al. 2017; Cao et al. 2018). Some female use big size and other maternal resources by last laid eggs to compensate for the survival disadvantage experienced (Saino et al. 2010; Newbrey et al. 2015). Magrath et al. (2009) showed that, given consistent environmental conditions, eggs laid earlier start to develop before the female bird has finished laying the entire clutch, so the first eggs laid hatch before the last eggs do. As a result, the clutch includes nestlings with an extreme imbalance in mass quality (Magrath et al. 2009). However, other research indicated that the eggs of Canada Geese (Branta canadensis) from the same clutch hatched at about the same time, with a maximum time interval of less than 24 h (Boonstra et al. 2010). Therefore, the embryonic development rate differed for eggs within the same clutch. So far only a small number of studies have focused on the relationship between laying sequence and embryonic internal development rate in birds showing that laying sequence can affect embryonic development (Nicolai et al. 2004; Boonstra et al. 2010; Cao et al. 2018; Yang et al. 2018). Zebra Finch (Taeniopygia Guttata) clutches number can alter the developmental time of embryos, egg maternal resource allocation across the laying sequence can influence development (Griffith and Gilby 2013). In this study, using artificial nest boxes, we compared the effects of laying sequence on eggshell color variation and embryonic development speed of Russet Sparrows (Passer cinnamomeus), a passerine species. This study was conducted in the Kuankuoshui National Nature Reserve (28°10ʹN, 107°10ʹE), a subtropical evergreen broadleaf forest in southwestern China at an altitude of about 1500 m (see Yang et al. 2010 for more details) from April to August 2013. The Russet Sparrow belongs to the Passeridae family and is mainly found in southern China and the Himalayan region (Summers-Smith 1988). They are year-round residents at this study site, and they build nests in chimney tubes, cavities of stone walls and eaves (Yang et al. 2012b; Huo et al. 2018). 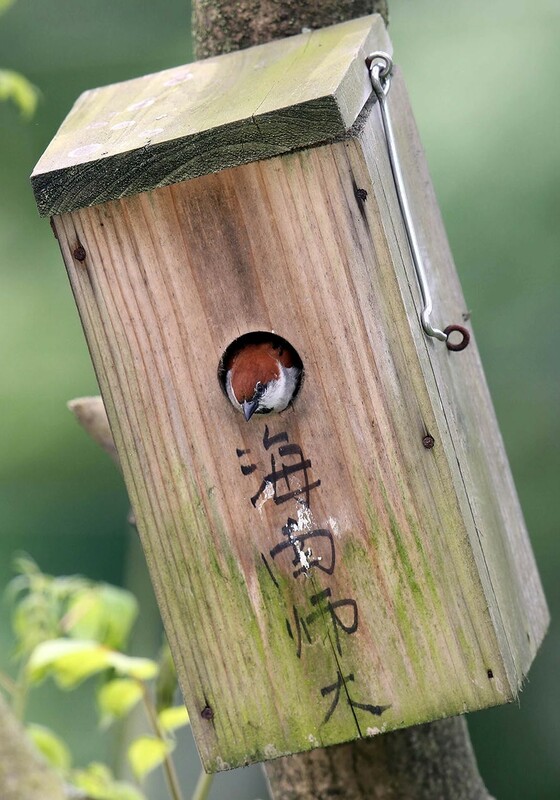 Artificial nest boxes were provided to attract sparrows because entrances to their natural nests are usually too deep and small to allow easy access (see below). Nest boxes were 35 cm in depth with an entrance hole diameter of 4 cm (Fig. 1). We checked each box periodically until the first Russet Sparrow egg was observed in the nest, after which the nests were checked once a day to confirm if the onset of incubation start with the first egg or until after clutch completion. When a new egg was discovered in the nest, the tip of the egg was numbered with a light blue marker to indicate egg-laying order. After a full clutch of eggs had been laid, they were all replaced with model eggs and moved to an incubator together. We did so because Russet Sparrows start their incubation after clutch completion and accept any model eggs in their nests and seem not to show any egg discrimination (Huo et al. 2018). After the nestlings hatched, they were returned to their original nests to be raised by their parents. We divided the sparrow eggs into three groups. The first eggs to be laid were first group (one egg), the eggs that were intermediate in the laying sequence were middle group (two or three eggs), and the last eggs to be laid were last group (one egg). The middle group has two or three eggs, so we analyze the data using an average for the middle eggs. A caliper (505-681, Mitutoyo, Japan; range 0–150 mm, accuracy ± 0.02 mm) was used to measure the length and width of the eggs. An electronic balance (EHA501, Guangdong Xiangshan Weighing Apparatus Group Co., Ltd.; range 0–100 g; accuracy 0.01 g) was used to weigh the eggs. The volume of the eggs was calculated according to Hoyt (1979): egg volume = 0.51 × egg length × square egg width. The eggs in each group were weighed from the first day of incubation, and daily afterward, until nestlings had hatched. 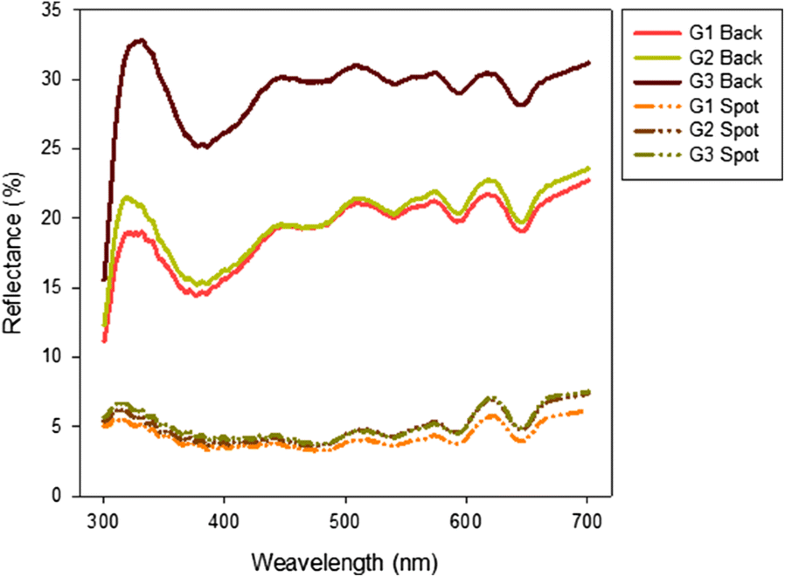 Egg color was quantified using a USB4000 VIS–NIR spectrometer (Ocean Optics, Inc., Dunedin, Florida, USA). Background and spot color were measured at three randomly chosen places on each egg. A detailed description of the method can be found in Yang et al. (2009, 2010). The values of the ultra-violet (300–400 nm) and visible (400–700 nm) sections of the reflectance spectrum were used for analysis. The eggs were hatched in a Mini EX digital incubator (Brinsea Co. Ltd., UK; also see Yang et al. 2018). Embryonic heart rates were measured using a digital egg monitor MK1 type heart rate meter (Buddy Digital Egg Monitor, Avitronics Inc., Cornwall, England). In order to avoid errors in heart rate measurement due to differences in temperature, the eggs were placed horizontally in the heart rate meter for the measurement immediately after they were removed from the incubator (also see Zhao et al. 2017; Cao et al. 2018; Yang et al. 2018). The heart rate (beats per minute) was recorded after the heart rate became stable. Heart rate measurements started on the first day of incubation and were conducted every other day, until the nestlings hatched. The embryonic development time was defined as the time interval between the first appearance of heart rate (which occurred 2–5 days after the start of incubation) and hatching (Cao et al. 2018). The incubator hatching temperature was set at 7.5 ± 0.5 °C; the relative humidity was 55 ± 5%; the egg turning interval was r/45 min; the cooling time was 2 h/day. One-sample Kolmogorov–Smimov (K–S) test was used to analyze the normality distribution of the data. If the data satisfied the conditions of normal distribution, one-way analysis of variance (ANOVA) was used to compare the means. If the data were not normally distributed, Welch’s ANOVA was used. Differences at p < 0.05 were considered statistically significant and at p < 0.01 were highly statistically significant. Unless otherwise stated, data were presented as mean ± SD, and all tests were 2-tailed. Statistical analyses were performed in IBM SPSS 20.0 for Windows (IBM Inc., USA). Each Russet Sparrow clutch contained 3–5 eggs (n = 69). One egg was laid each day, normally in the early morning. Whitening in last eggs was relatively apparent to the naked eye in the majority of nests because pale colors reflect more ambient light than dark colors (78.5%, n = 69) (Fig. 2). Background color reflectance of last eggs was significantly higher than those in the other two groups, confirming that whitening occurred (Fig. 3). Spot color reflectance among the three groups was similar, all spots being dark brown (Fig. 3). The brightness reflectance of the background color was significantly higher in last eggs than in the other groups (F = 10.817, p = 0.001). Except for green light chromaticity, the other lights’ chromaticity of the background color showed significant differences between the groups. Last eggs had the highest ultraviolet (UV) and blue light chromaticity (F = 3.531, p = 0.041; F = 3.986, p = 0.028) and the lowest red light and yellow light chromaticity (F = 3.890, p = 0.030; F = 3.655, p = 0.037). However, there was no difference in background color hue among the three groups (F = 1.518, p = 0.234) (Table 1). The spots on the eggs in the three groups did not significantly differ in brightness, hue, or chromaticity (Table 2). When the first Russet Sparrow egg was observed in the nest, we checked once a day to confirm that Russet Sparrows start their incubation until after clutch completion. The three groups did not differ in egg size, mass, or weight loss during development (Table 3). Hatching success rates of first, middle and last groups were 41.7, 46.1, and 25.0%, respectively, without significant differences (χ2 = 1.55, p = 0.46). The embryonic heart rates among the three groups of eggs followed approximately the same trend. 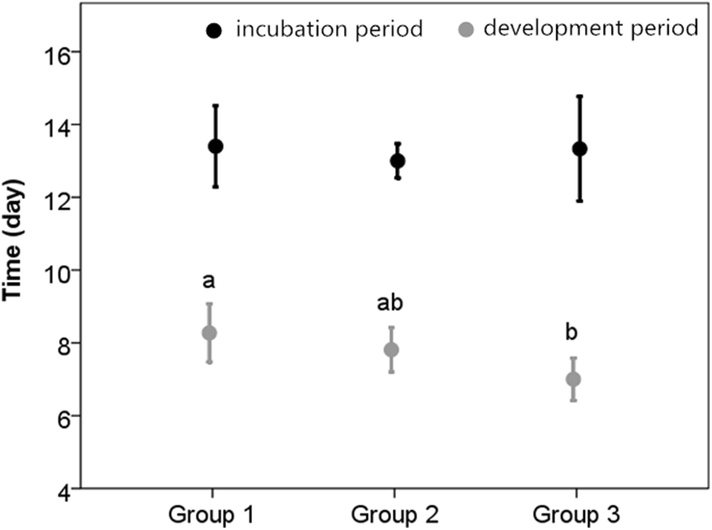 Embryonic heart rate increased as the number of incubation days increased (Fig. 4). Heart rates became detectable between two and five days after the start of incubation but appeared latest in last eggs. The highest heart rates appeared on the day of hatching (i.e., day 13) for first and middle eggs, but on day 11 in last eggs. Regression analysis using linear and cubic models showed that a regression curve was the best fit for the heart rate change in first eggs, indicating that the heart rates of these eggs were the most stable. The regression curve fit was the poorest in last eggs, indicating that embryonic heart rate change in these eggs fluctuated the most. The incubation period was around 13 days in all three groups, without significant differences (F = 0.589, p = 0.566). The embryonic development time of the last eggs was significantly shorter than those of the first eggs (F = 3.60, p = 0.040) (Fig. 5). Our spectroscopic analysis showed that Russet Sparrow eggs gradually became lighter as the laying sequence progressed, with a relatively large eggshell color variation coefficient. This change is mainly manifested in the background color of the eggs. Lowther (1988) believed that the amount of pigment secreted by glands in birds is limited, and the pigments gradually subside as egg-laying progresses. Therefore, pigments could be exhausted or in short supply by the time the last egg is laid, which results in its whitened appearance. However, in this study, whitening also appeared in eggs that were laid earlier. Hence, Lowther’s hypothesis does not hold here. Some researchers believe that egg colors of cave-nesting birds tend to be white and to lack spots. One reason might be that white eggs are more easily seen by parent birds in cave nests with lowlight (Lack 1958). Another selective pressure, the existence of nest parasites, can force hosts to increase the evenness of egg color in a clutch, as it enable parent birds to more easily detect an intruder’s egg and at the same time increase the diversity of egg color among clutches of the same species (Stokke et al. 2002; Spottiswoode and Stevens 2011). One hypothesis states that the whitening of the last eggs to be laid could be a signal that prevents nest parasites, by informing the parasites that the hosts have completed egg-laying and the egg incubation period has started (Yom-Tov 1980; Ruxton et al. 2001). Although there are many parasitic cuckoo species in the study area (Yang et al. 2011, 2012a), despite evidence that cuckoos can parasitize cave-nesting birds and that some cave-nesting birds are suitable hosts for cuckoos (Deng 2013; Grim et al. 2014; Liang et al. 2016), Russet Sparrow was not the host for any type of cuckoos (Huo et al. 2018) in this study area and no intra-species parasitism has been observed so far. Hence, the evolution of egg color diversity of Russet Sparrow needs further investigation in the future. Previous studies believed that the color of birds’ eggs is related to the mass of eggs and that different egg colors reflect different levels of egg quality (Moreno and Osorno 2003; Morales et al. 2006; Newbrey et al. 2015). Our data showed that the color of Russet Sparrow eggs was not associated with egg size or mass, and laying order also did not affect size or mass. However, egg-laying order did affect embryonic development rate. Russet Sparrow eggs in the same clutch had the same hatching period and all hatched on the same day (within 24 h). The heart rates of eggs laid earlier were detected earlier, and these eggs had relatively longer embryonic development periods, while the heart rates of eggs laid later were detected later. These eggs had shorter embryonic development periods but higher development speed. In House Sparrows (Passer domesticus), most eggs of a clutch hatched synchronously and there was no difference in hatchability in relation to sequence of egg-laying (Singer and Yom-Tov 1988). Full incubation began after the completion of the clutch in clutches of two and three eggs in both House Sparrows and clutches of four eggs in Tree Sparrows (P. montanus) but before the clutch was completed (by up to one day) in larger clutches (Seel 1968). In Black Brant (Branta bernicla nigricans), embryonic metabolic rate may affect development in synchronizing hatch (Nicolai et al. 2004). In addition, the decline in egg size as laying progresses could contribute to hatching synchrony because those subsequent embryos tend to have higher metabolic rates which hypothesized also contributes to relatively more rapid development (Nicolai et al. 2004). Such phenomenon has also been verified in Zebra Finch (Taeniopygia guttata), a passerine bird, as well as in some non-passerines (Nicolai et al. 2004; Boonstra et al. 2010; Griffith and Gilby 2013; Granroth-Wilding et al. 2014; Hemmings and Birkhead 2016). The number of Zebra Finch eggs in a clutch also influences the eggs’ embryonic development speed (Griffith and Gilby 2013). Hatching asynchrony results in a brood with nestlings that differ in age and size. Older and larger nestlings usually outcompete younger ones for food and, as a result, grow more quickly (Zach 1982; Kacelnik et al. 1995), while the last-hatched nestling reduced growth and survival (Wiebe 1996; Ostreiher 1997). Complete hatching synchrony leads to uniformly aged nestlings (Clark and Wilson 1981; Stoleson and Beissinger 1995). The hatching time of some birds can be affected by the vocalizations of parent birds or nestlings of the same clutch, as these sounds can stimulate the embryo to speed its development (Saino and Fasola 1996). In summary, we showed that the background color brightness of the last eggs laid by Russet Sparrows was significantly higher (whiter) than those of the other eggs. However, all eggs were hatched around 13 days, indicating that laying sequence significantly affected embryonic development speed; the last eggs to be laid developed significantly faster than did the first in the clutch. Our study also indicated that laying sequence has an important effect on the embryonic heart rate in Russet Sparrows. WL designed the experiment, JH, TS and NN conducted the experiments and collected field data. JH and CY performed data analyses and wrote an earlier version of the manuscript. WL revised and improved the manuscript. All authors read and approved the final version of the manuscript. We would like to thank Prof. Anders Pape Møller for his helpful comments on this manuscript. We thank Junqiu Wu, Guoxian Liang, and Ping Ye for their assistance with fieldwork, and the help and cooperation from the Kuankuoshui National Nature Reserves. The experiments comply with the current laws of China, where they were performed. Permit for this study was approved by Kuankuoshui National Nature Reserves, Guizhou Province. Experimental procedures were in agreement with the Animal Research Ethics Committee of Hainan Provincial Education Centre for Ecology and Environment, Hainan Normal University (permit nos. HNECEE-2011-002 and HNECEE-2013-001). This work was supported by the National Natural Science Foundation of China (No. 31672303 to CY, and 31772453 to WL).